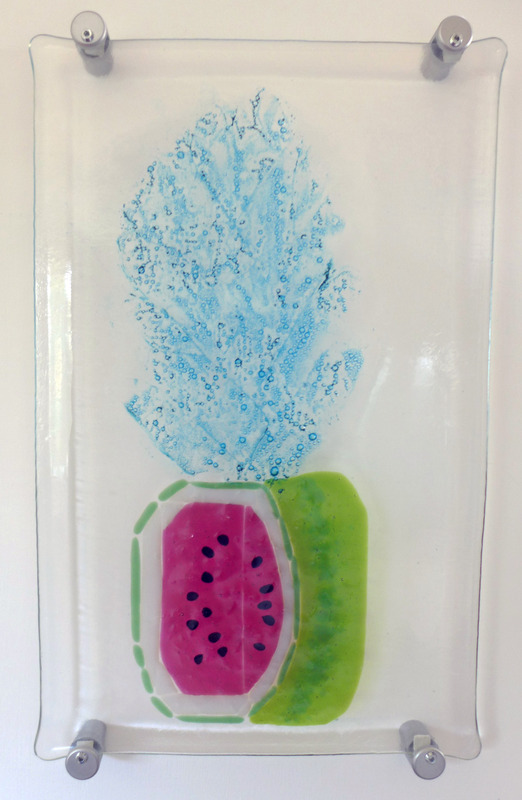 Sometimes I just can’t resist experimenting with the amazing properties of glass to produce works which range from the novel to the frankly wacky. Here are just a few. This is an a piece experimenting with the effects of undulating textures, discordant with undulating colours. 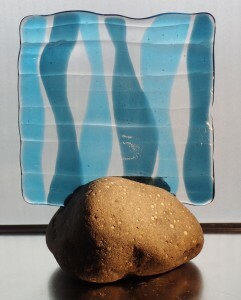 The strong colours work best lit from behind, so it is mounted in a Northumbrian rock. 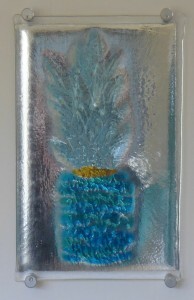 This is based on a mould of a pineapple, giving the textures. The colours show the tropical island associated with pineapples. 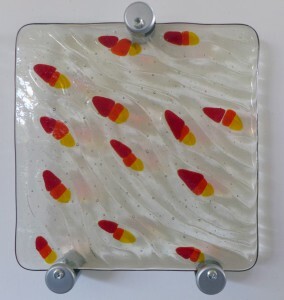 It is mounted over mirror to emphasise the textures. 24 x 37 cm. Board mounted (40 x 50 cm). £180. 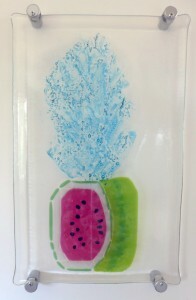 This is based on the mould of a pineapple, giving the textures, but using the colours of watermelon. It is just a fun mix of these tropical summery fruits. The bubbly leaves reflect the juicy qualities. This pattern is taken from a close up photo of mushroom coral. It was just such a simple organic pattern, that is not always easy to recreate! The colours emphasise some of the ridges in the coral. 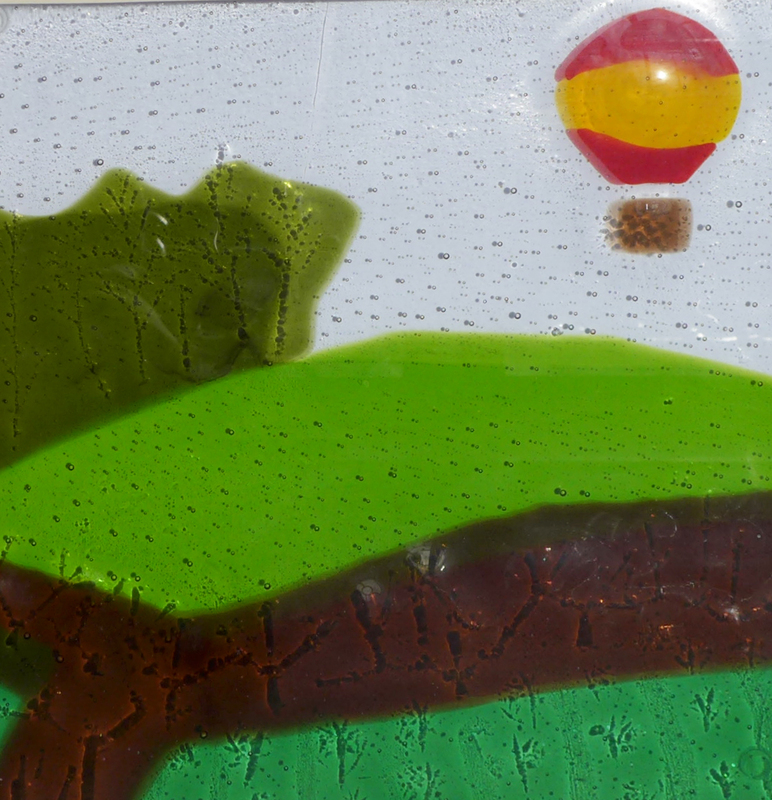 We sometimes see balloons drifting over the fields around Felton on still summer evenings. I used twigs and pieces of conifer to give texture to the trees, hedges and crops.